After giving it some thought, I have decided to share most of our numbers apart from our net worth. I hope the numbers I have decided to share will help to provide some context into how we are hoping to achieve FI. I will continue to update this page which will provide a summary of our numbers as well as a timeline of our journey towards FI. You can see our numbers in more detail broken down for each tax year by clicking on the relevant buttons below. I will document from the tax year 2016 – 2017 onwards. In all honesty, I just haven’t got the time write up everything going back further, but the summary on this page should give you an idea of how we managed our finances before we found out about FI. Whilst I was studying, my savings rate was zero. It is not something I am proud about and in hindsight, I should have set some money aside sooner for an emergency. However, I did manage to save up for a Masters degree without taking on more debt to fund it. As soon as I started working properly, I really focused and started to squirrel away money properly. In 2015, our savings rate jumped because Mrs. CC and I decided to pool our resources together. To this day, we still ask each other why we waited so long?! Perhaps it had something to with our three or four holidays a year. We have actually returned from holiday to immediately take another flight to go on another one! That’s a story for another time. 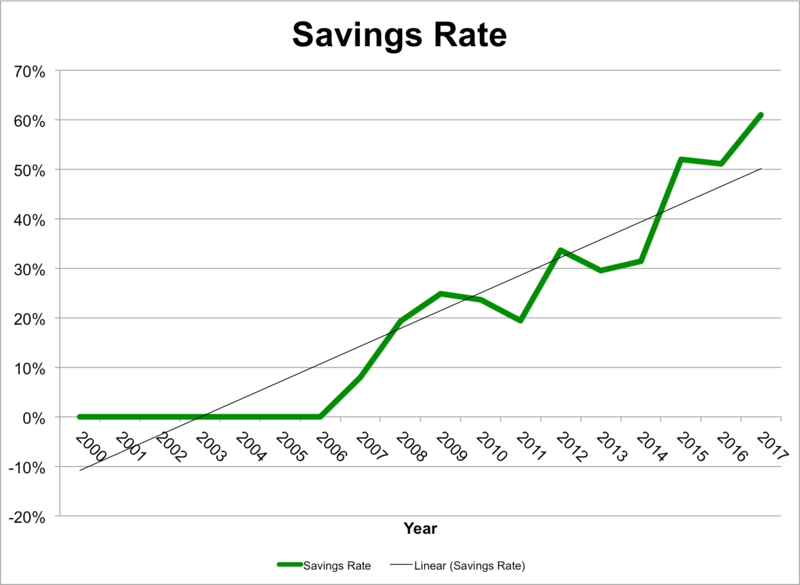 The chart below shows my savings rate since I was old enough to work. Mrs. CC has never had any consumer debt. She has used credit cards, but only to obtain points and she always paid off her balance in full every month. 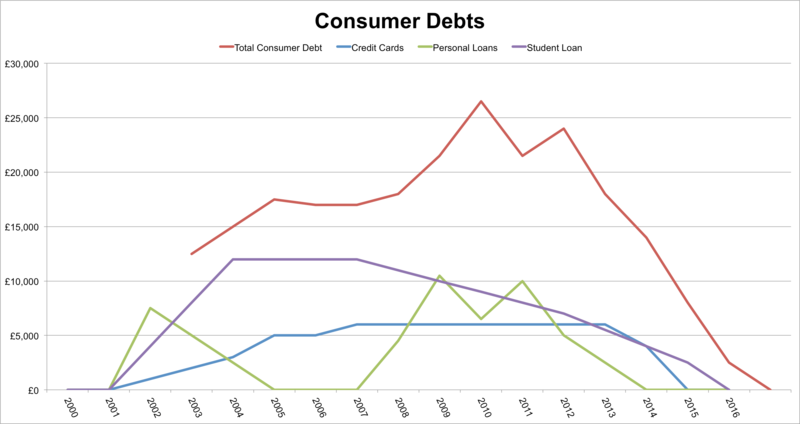 The chart below shows my consumer debts over the years. The total includes my credit card debts, personal loans and student loan. We currently have no consumer debts and I have no intention of taking on any more in the future. We see property as a valuable asset class which helps us to diversify. 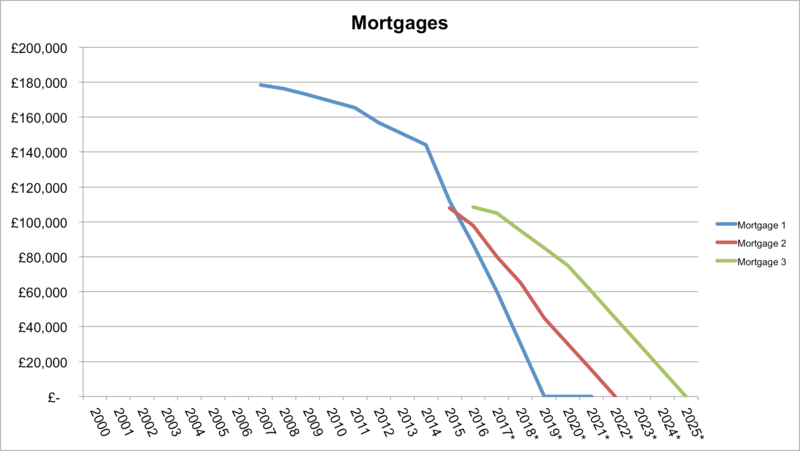 The chart below shows our mortgage debts over the years. We are currently aggressively playing down these mortgages. In the interest of transparency, I was only able to buy Property 1 due to a small informal loan which I have paid off. Property 2 was purchased with my parents. They own a 20% share, with myself and Mrs. CC owning the remainder 80%. Property 3 was purchased with a small inheritance Mrs. CC received together with some savings. We both acknowledge and are grateful for what we have and what has been gifted to us. Receiving an inheritance comes with it alot of responsibility. We are very conscious to ensure that we not only protect this inheritance but ensure that it grows for future generations. We were not tempted in the slightest to use a single penny of it to go on holiday or buy a new car. I will write about this more in another post. The chart below also shows the predicted mortgage balances over the next few years. The timeline below shows our personal finance journey and our discovery of FI. Some of the dates I have selected a random month or day as a precaution to disguise our identity. My first proper job at 16 in hospitality. I saved money, but only to spend it all. I go to university for my undergraduate studies. Her first job at 16 in the publicity department of a college. I finish my undergraduate studies. I’m back at university for my postgraduate Masters degree. I finish my postgraduate studies. 25-year mortgage on a three-bed end-terraced property with lodgers. Mrs. CC joins the RAF and begins her university studies to be a Nurse. Her studies were funded by the military and whilst also receiving a salary from them. Mrs. CC starts university, fully funded by the Military. Cashflow Cop and Mrs. CC Meet! Mortage renewed and reduced to 17 years. I’m back at university for another postgraduate Masters degree, this time fully funded by the Police. Mrs. CC graduates with her nursing degree. I discovered the book: The Richest Man in Babylon. A few days later, I find the blog Mr. Money Mustache. Mrs. CC and I begin to talk about FI. Mrs. CC and I begin to pool our resources and seriously work towards financial independence! Mortgage renewed and term reduced to 5 years. 10-year mortgage on a three-bed end-terraced property which is rented out. Cashflow Cop & Mrs. CC are Married! I finished my postgraduate studies. 25-year mortgage on a three-bed end-terraced property which is rented out. Mortgage renewed and term reduced to 7 years. That interactive timeline is bloody brilliant! Thanks for sharing your journey from the start with the numbers! WOW love that timeline! How did you do it? Love seeing the beginning of your journey! Hi there LMF. Thanks. I used a free plugin called Timeline Express in WordPress. It’s quite easy to use once I got over the initial how does this all work moment. I’m late to this blog, but – awesome timeline! Wow, that timeline is a really effective presentation mechanism, tells your story well. Also love the design of your blog, easy to read plus feels clean and inviting. Well done! Very kind of you to say. Improving my writing is what I am working hard on and the blog helps me do that. Well done again on your nomination!